BELLEVILLE – The second ever Hockey Night in Belleville kicks off tonight. 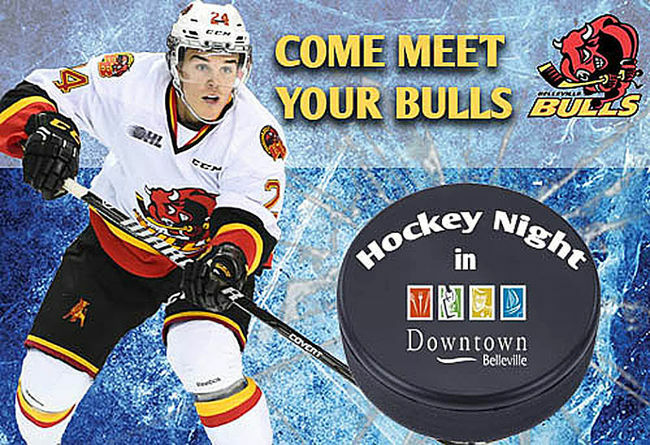 Belleville Bulls players will be in the downtown in shops doing different activities in every participating store. But this year’s event will be different than last year’s according to Downtown Belleville Improvement Area’s Events and Office Coordinator Erica Holgate. She says, they have added in some extra fun from last year. When your passport is signed by every Bulls player, you get a voucher to a free Bulls game and a chance to win a Bulls jersey signed by every player. Holgate says Hockey Night is an event for all ages. And it includes free hot chocolate and even an inflatable shootout tunnel. The event is meant to bring people to the downtown and support local Christmas shopping. Shops will be open late and offering a number of promotions. Hockey Night in Belleville kicks off at 5:30 p.m., the DBIA just asks you bring a non-perishable food item to their office downtown.